Do you ever feel a bit uncomfortable about shaking hands with people when you meet them? Concerned about hygiene, and all those germs you’ll pick up “pressing the flesh”? Worried about having your piano-playing fingers crushed by the over-enthusiastic clench of Mr. Assertive? Then read on, and I will go over a few points that might help! Shaking hands is an ancient ritual which is reported as long ago as 2800 BCE in Egypt. 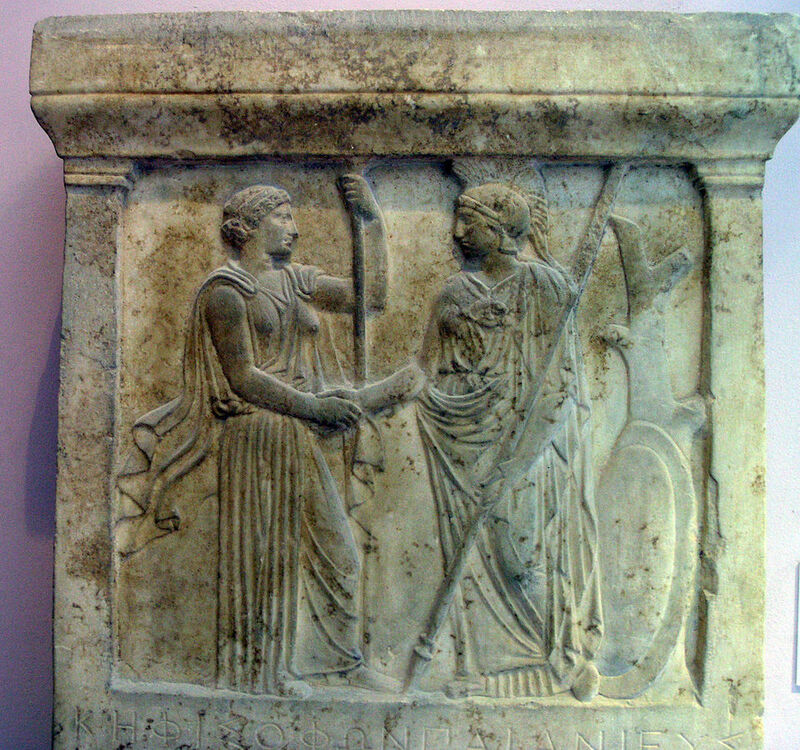 We have images of hand shaking from ancient Greece, such as the one shown here – Hera and Athena handshaking, late 5th century BCE (now in the Acropolis Museum, Athens). Some speculate that because the right hand is the “weapon” hand, presenting the empty hand was seen as a sign of peace and acceptance. It is interesting to note that in Asian cultures, where many martial arts moves can start by grabbing the hand, shaking hands was traditionally less popular! This is why for ceremonial occasions and important leader meetings respectful bowing is preferred. It is also why many Chinese in daily life nod the head rather than shaking hands. However, it is important to realise that hand shaking remains one of the most important forms of greeting in most Asian cultures, although usually the hand shake itself is more gentle than it is in Europe and North America. A study conducted by the Weizmann Institute of Science found that shaking hands can serve as a means of “Social Chemosignalling” between people, perhaps meeting an evolutionary need to learn about the person whose hand is shaken. Quite how this happens is not fully determined, but I wouldn’t be surprised to hear in the future that this links up with the theories of Traditional Chinese Medicine and Qigong, which highlight the importance of the so-called ‘laogong’ point. 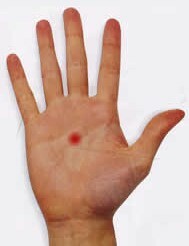 In Chinese medicine, there is a point in the hand called ‘laogong‘, (Pericardeum-8) which is an important gateway for energy transmission and absorption. When you shake a person’s hand, your laogong point makes contact with theirs, which is perhaps another of the reasons why – intuitively – shaking hands became such an important and universal practice around the world. The laogong point isn’t only recognised within TCM. It also has key importance within Japanese Shiatsu and traditional energy healing practises around the world. These traditions independently developed an understanding of the significance of ‘laogong‘. The more important issue here, however, is general hand health. Given how important our hands are, it is understandable that we want to protect ourselves from the bone-crushers out there. However, once you know how to regulate the pressure of a hand shake it is possible to avoid social awkwardness and still protect yourself with ease. For those worried about pain, the advice is sometimes offered that simply allowing your own hand to go limp will quickly end a handshake. While this is true, it comes at the cost of potentially ending a relationship before it even starts. To the insecure party it can communicate rejection, while to the assertive hand shaker it can communicate that you are not their equal, and they will probably move along to somebody else who they perceive is. Neither of these responses are probably what you intend. If a person’s handshake seems too firm, or even painful, it means they are squeezing harder than you. If you increase your own squeeze it will meet and properly balance theirs – you should no longer feel any discomfort. You can then regulate their squeeze by gently reducing yours. Having established the connection they will follow your lead, and in effect it puts you in control. I recommend trying this out with a partner or somebody you trust. Explore how altering your own pressure will be reflected by them. You may be very surprised by the results! For those who prefer to avoid hand shaking altogether, firstly you are missing out on an important element of interpersonal bonding that’s been built into us over a very long time. So it might be a good idea to find a confident, assertive alternative that you are comfortable with. Hugging is a nice one, but obviously not always appropriate! A nod of the head can also work as a good substitute, so long as you smile openly and give good eye contact. I hope that this short introduction will encourage you to shake hands with people with a new confidence and more understanding, and overcome any reservations you have. A very, very interesting read, Andrew – thank you – and one of the things that I was actually thinking about over the weekend. I get to shake a lot of hands at an art fair. More often I get a medium or firm shake in response (I figure I tend to give a firm grip) but occasionally I’ll get the feeling that I’ve just grabbed the corner of someone’s dishrag, and I* end up being the bonecrusher, it’s most disconcerting! One thing that occurred to me as you talk about other greetings – I did notice a difference in that I gave, got and saw far less hugging – what I’ve started calling the California handshake – in Flagstaff, AZ. Maybe that the Arizonans and mid-westerners that were most of the people I talked to, are a little more formal, though it could be a factor of that in the Cali shows I do, I already know more of the artists so hello and goodbye hugs tend to propagate more easily among us once started. Another thing I learned in the last year is that some stricter Jewish sects don’t hug or shake – in fact don’t accept physical contact at all as a greeting, though I don’t know if it’s only with non-Jewish that their faith disallows this. The person I was introduced to by a close friend circumvented this by claiming a cold as his reason for not touching and the issue was resolved by the ‘virtual’ handshake. It was only later I was told the truth; this was a disappointment that he had felt unable to share his belief with me, especially in a city where just about everything* that doesn’t hurt others is accepted.